Traveling during the holiday season means overcrowded airports, waiting in long check-in lines, and arriving early to ensure you make that flight. Skype hopes to make your travel experience a little smoother this year by offering free Wi-Fi at 50 major U.S. airports. Users of Mac, PC, and iOS devices can take advantage of this limited-time offer—just make sure you have the latest version of Skype on your Mac or that you have the Skype Wi-Fi app ( ) on your iPhone or iPad. The service will be available at select third-party wireless hotspots within the participating airports. Once you've logged in with your Skype ID, check your wireless network connection to see if you’re in one of these supported hotspots. If you are, you’ll then be granted one hour of free Wi-Fi. 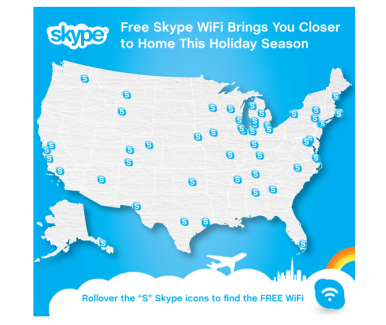 Skype’s free Wi-Fi will be offered from December 21 through December 27 at each participating airport. Check out Skype’s interactive Wi-Fi map to see which airports are included. And for more information on your connectivity options while traveling this year, check out this report on the most tech-friendly U.S. airports.